Well, the cat is out of the bag. Or rather, the God of War is out of the bag. Saturday night at the Spike Video Game Awards, Warner Bros. and Netherrealm Studios announced that Kratos would be joining the line-up for Mortal Kombat, exclusively on the PlayStation 3, this April. Great news and all, sure. But Xbox 360 owners are being left in the dark, without an exclusive character to call their own. Yet, anyways. With that, many people are wondering who they’ll get for their edition of the game, if anyone at all. Well, we have a few suggestions as to who we would like to see step up in that particular edition of the game. Enjoy, and if you have any suggestions, fire away in our comments! Um…dare we say “Duhhhh”? Master Chief is no doubt Microsoft’s most iconic character, despite the fact he was missing in action this year while other Spartans took the battlefield in Halo: Reach. Chief would fit right in to the MK universe, with a huge rifle at his side and the ability to throw force field grenades to temporarily protect himself while pushing enemies away. He can also launch grenades and call in air strikes like a pro, perfect for ambushing the likes of a freeze-ball throwing Sub-Zero or a spear-chucking Scorpion. And for his fatality? Pulling out a Gravity Hammer and smashing an opponent to bits, of course. It could totally work. Marcus is definitely a soldier of misfortune, going up against the Locust Horde and all that in the Gears of War games. Still, he’s always ready for battle, and his persona and no-quit attitude would be absolutely perfect for Mortal Kombat. His up-close melee attacks would make him lethal from close range, and his rifle would equally do some damage from a distance. Plus, with the chainsaw blade on the end of his gun, that makes for the perfect fatality, slicing an opponent in half, Locust style. We’re sure that if he was included in the game, Cliff Bleszinski would be smiling ear to ear. And, hey, it would tie in perfectly with 2011’s release of Gears of War 3. Think about it, Netherrealm. Okay, so Perfect Dark Zero wasn’t as well received as Microsoft was hoping it would be in 2006. Still, this year’s downloadable reboot of the original Perfect Dark did fairly well for the company, so it’d probably be ideal to bring Joanna Dark back to another medium — Mortal Kombat. Think about it. She’s got the same kind of physique as Sonya Blade, and with her assassination skills, she would be lethal both up-close and with ranged attacks. As for a fatality, how about getting in close to an opponent and going to town with a couple of old-school Klobbs? That would work for us. When James Silva, developer at Ska Studios, produced the epic side-scrolling bloodfest The Dishwasher: Dead Samurai last year, he introduced a nice forward movement in independent game development, and a great new hero for Xbox Live. With his sword and gun, Dishwasher would be a perfect fit for the MK universe, with his fast movement, his lethal sword strikes, and his quick-firing action. He’d be one force to be reckoned with. As for a fatality, hey, nothing beats a nice, simple decapitation, or perhaps striking an opponent in half, just like Kung Lao. His appearance in the game would tie in with his forthcoming Xbox Live sequel, Vampire Smile, very nicely. 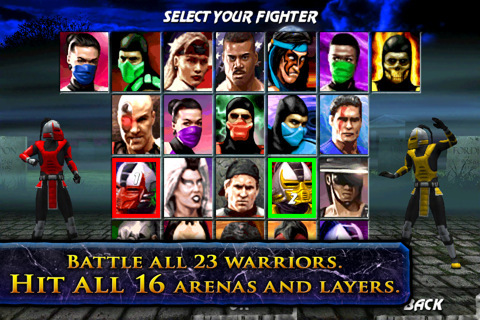 Who’s your choice for Xbox 360-exclusive character for Mortal Kombat? Sound off!